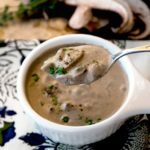 Ditch the can this holiday season by making CONDENSED CREAM OF MUSHROOM SOUP from scratch for all your casserole needs. Or you can just eat the soup because it is luxuriously creamy and rich! Ever read the ingredient label on a can of condensed cream of mushroom soup? It contains more oil than cream, MSG and what is soy protein concentrate? Good news is you can skip the processed soup with this scratch recipe! When coming up with my posting schedule for the holiday season, I reached out to my friends to see what recipes they would like to see on the blog. Many said they would like recipes that could be made ahead. But one specific request came from my sister. She asked how you can make green bean casserole from scratch. 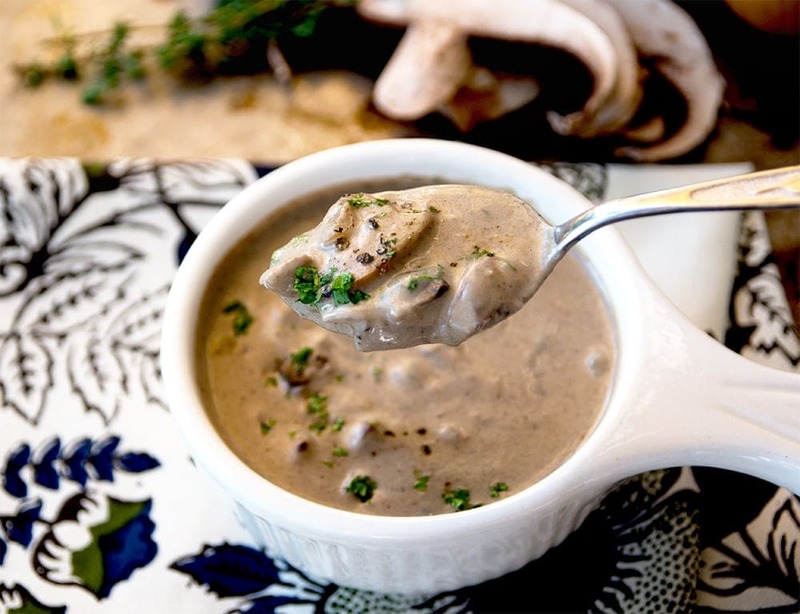 Condensed cream of mushroom soup is easy to make. So easy, its a travesty to even think about reaching for a can of processed goo. If I cannot pronounce the ingredients and don’t know what they are, I put them back on the shelf. And have you noticed how everything contains MSG lately? It may surprise you to know that mushrooms naturally contain MSG, so why add extra? 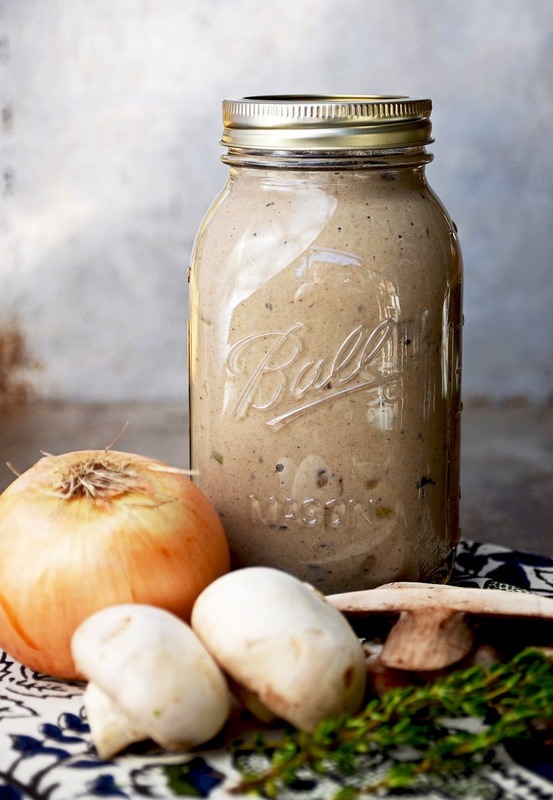 So this better-than-a-can cream of mushroom soup recipe uses REAL ingredients. 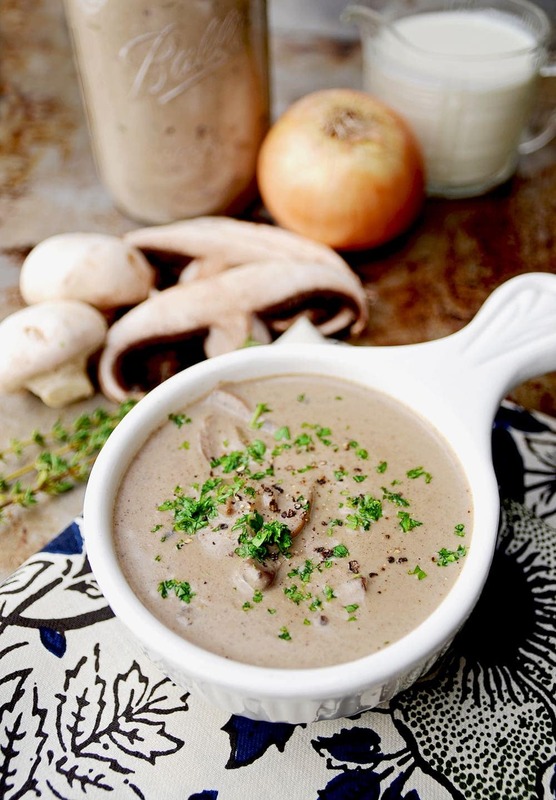 Things like mushrooms, onions, milk, celery and cream to make a satisfying, yummy soup. So get your soup pots ready folks! Make this extra large batch of soup so you can make dinner and freeze some for your holiday casseroles. Kill two birds with one stone? That’s my multi-tasking kind of dinner! Look at all this soup-tastic realness! Perfect for a fall meal with a grilled cheese sandwich or a healthy salad and oh my will your casseroles taste divine! If you give this recipe a try, let us know what you think by leaving a comment below or tagging us on Instagram @vintagekittyblog. We love to hear from you! 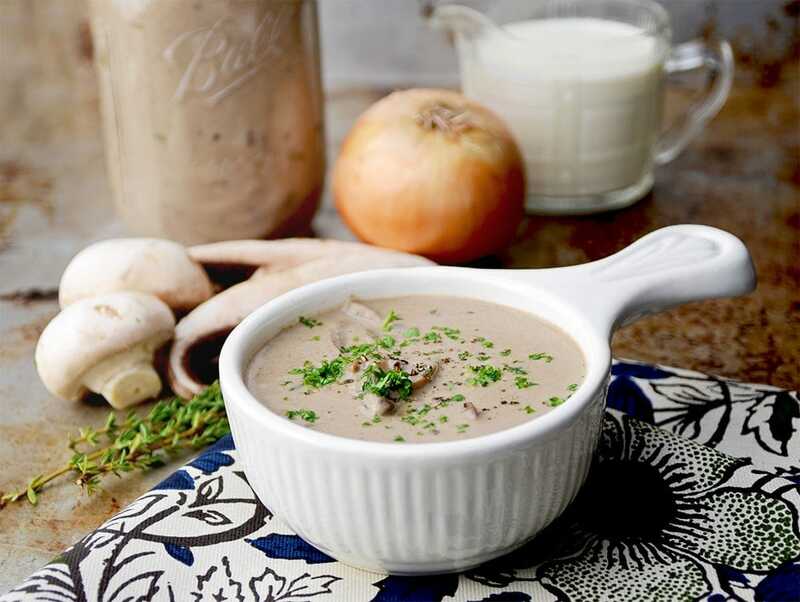 This recipe makes a thick, condensed style of cream of mushroom soup that can be used in casseroles or thinned to eat as a luscious soup. In a large soup pot, melt butter over medium-high heat. Add onions, celery and garlic and saute until onions are translucent and starting to turn golden brown. Add mushrooms and cook until softened, about 5 minutes. Sprinkle flour over veggies and cook one minute. Add cider or wine while stirring constantly. Add in milk, cream and thyme and bring to a gentle boil. Puree half of the soup and add it back into the pan. Use immediately in casseroles or freeze for future use. To eat as a soup, thin to desired consistency/taste with vegetable or chicken stock and garnish with fresh parsley. Makes 9 cups of condensed soup. To thin to a soup, add chicken or vegetable stock at a ratio of about 2 cups soup to 1 cup stock. Add stock in increments and taste with each addition. Stop when the soup is at the consistency you prefer. 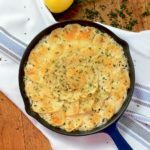 This Lemon Thyme Potatoes au Gratin recipe is a perfect side dish for special meals, holiday gatherings and anytime you want to treat yourself to a special dish! I made this a few years ago for Thanksgiving at my in-laws. Between this amazing soup and you Susan’s party onions, I blew everyone’s minds. I’m excited to make it again for my visiting family this year! Homemade is best! Thanks for making my recipe friend! xoxo! I’m totally making this for our Thanksgiving string bean casserole this year! 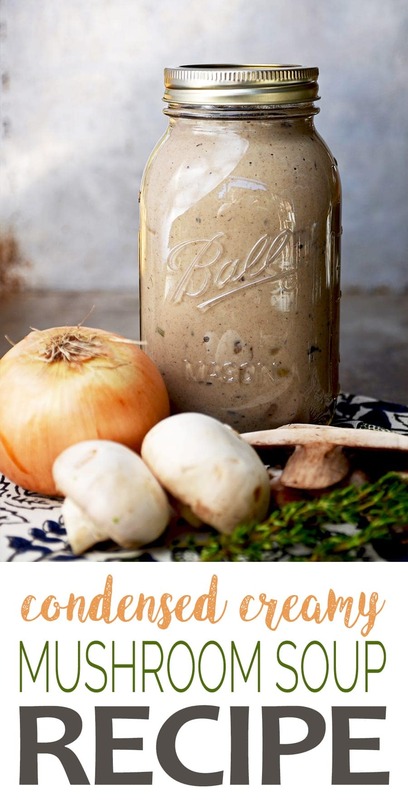 I haven’t been able to eat cream of mushroom soup due to the garlic and onion in all the storebought ones, but I plan to make a few substitutions and otherwise use your recipe. I can’t wait to see how it turns out! I used to have terrible reflux so I feel ya! If you have savory or lovage, those can add a lot of flavor to the broth. Parsnips and celery root are other options. Let me know how it goes! Alright, so I absolutely love this recipe. Even after cutting out the onion and garlic, having a cup less celery than I thought I did, and screwing up the order a bit due to television distraction, it still came out delicious! I added a cup of diced fennel – I find that helps add some depth when I have to eliminate onion and garlic from recipes. The result tastes like a much better version of the storebought cans (which I have very fond childhood memories of). 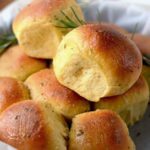 I can only imagine how good this recipe would be WITH all the right ingredients! That’s awesome Kristen! Glad it worked out for you!